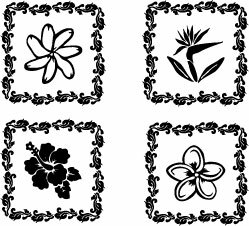 Rubber Stamp Plantation your source for stamps, stickers, decals, stencils, license plate frames and temporary tattoos with a Hawaiian flair. Tropical Etch Glass Etching Stencils are amazing, simple to use, and result in etched pieces looking of professionals and fine gift stores. We have perfected our Tropical Etching Stencils and are proud to offer this up and coming craft.